Supernatural continues developing Mick questioning his training and how that relates to practical hunting while setting the stage for the end of the season. Last week was an eye opener for Mick. He learned that things aren’t as black and white as he initially thought and that not all “monsters” are necessarily bad. This causes him to look back on his life and question everything that led him to this point. We get this insight through flashbacks that show how harsh his upbringing was. The loyalty test involving him killing his best friend is really brutal but also doesn’t really work. I can’t help but think that there are more subtle ways to show that the British Men of Letters are an organisation not too be trusted. The show has done a good enough job showing that there are layers to the organisation. Their introduction had one of their agents torture Sam and further appearances have shown complexity in their hidden motivations. The desire to recruit Hunters to their cause seems mostly genuine for example but there is always something elusive about them. Mick has been a good character to show the other side of the Men of Letters because he has always seemed pretty upfront and clearly wanted to make the partnership between his organisation and the Hunters work. Dean was reluctant to trust him but that’s something that Mick was willing to work through. Revealing that his loyalty was tested by making him kill his best friend removes the potential for the organisation to be redeemed because it is so blatantly evil. His death in this episode definitely feels premature. The character was starting to develop and the dynamic between him and the Winchesters was interesting to watch. Killing him off at this point makes no sense because there was still potential for him to develop. It’s not something that will mean an awful lot to Sam and Dean because they weren’t at the point where they liked him yet so they might be irritated at the injustice of it and Dean will use it as justification of his point of view but beyond that it won’t have any resonance to them on a personal level. The same applies to the audience as we haven’t spent a lot of time with the character so his death doesn’t have the impact it should. Mick’s death does come for the right reasons though. An all consuming “Code” is mentioned on multiple occasions that the Men of Letters clearly live by. That code says that those that die should be avenged. The circumstances surrounding the death of the Redshirt agent are accidental so Mick eventually sees that retribution isn’t fair in this instance. He proudly stands up for that belief and is killed for his trouble. There’s a tragedy to having him killed off for doing the right thing and that part of it is effective enough but it all feels so sudden. Mr. Ketch is shown to be cold blooded when he casually shoots Mick with no hesitation. It’s really harsh but shows how uncompromising Mr. Ketch is. The attempt to suggest a personal connection between him and Mick doesn’t quite work as it’s a throwaway comment with no weight behind it. I can see that the idea was to suggest that Mr. Ketch might be conflicted over his actions but there hasn’t been enough ground work to make that feel like a friendship that we should be invested in. 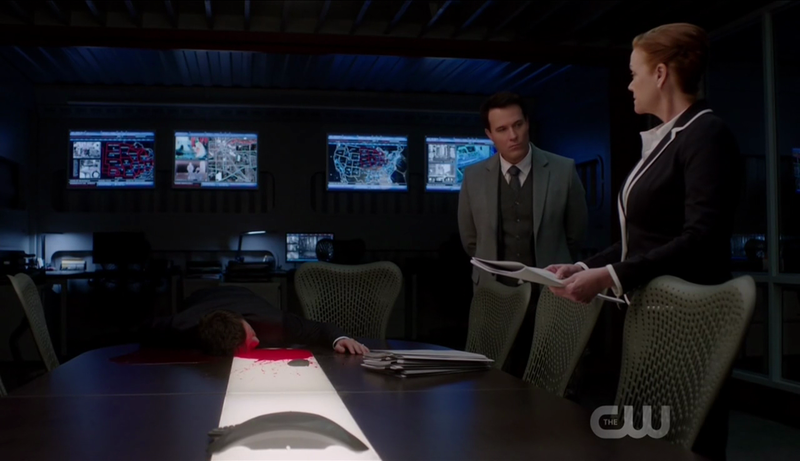 Maybe that will play out in later episodes as Ketch really needs to have more to him than the ruthlessly and efficient killing machine that we’ve seen up until now. Having him hook up with Mary didn’t work for me despite the fact that their relationship seemed somewhat flirtatious in prior episodes. My impression is that it’s entirely one sides to having her willingly sleep with him feels somewhat out of character. It was clearly designed to illustrate the point that there’s more to life than hunting but it doesn’t do it very well. Mary doesn’t want a relationship with Ketch which is fair enough but I don’t see how this connects to her point of it being possible to have a full life while hunting. Ketch is fully committed to his work which is unnerving because of how detached it makes him so it is clear that Mary doesn’t want to end up like that but it could have been illustrated more effectively. The introduction of Dr. Hess (Gillian Barber) doesn’t help the Men of Letters cause in any way. Just like the flashback she is so obviously evil that any potential nuance is drained from the story. Having her declare the experiment to work with American Hunters a failure and wipe them all out feels like overkill considering we haven’t seen much of this story playing out. It feels like there should be more to it than we have seen. Lucifer’s lovechild is a story that has been sitting in the background for a while and it definitely belongs there at the moment. A pregnant woman on the run with a Demon protecting her isn’t interesting enough on its own to sustain multiple episodes worth of content so checking in on it now and again is fine as far as I’m concerned. The development in this episode is significant as we learn a little more about what the consequences will be for Kelly. Giving birth to the child will be fatal for her -at least according to Dagon- which makes for a less than ideal situation if you happen to be Kelly. Interestingly her maternal instinct is continuing to grown and Dagon is fully enabling her to carry the baby to term. I’m thinking the baby will be born at the end of the season but won’t be dealt with until the next. I’m also interested in what Dagon’s true motivations are as they clearly have nothing to do with protecting Kelly beyond preserving the child. This plot brings back Eileen, the deaf Men of Letters legacy who helped with the Banshee last season. Her career as a Hunter is in full swing and I really enjoyed her dynamic with Sam. There’s a genuine bond there that comes across really well without pointing towards anything romantic. They are friends and partners based on what we have seen so far and it’s something we don’t see very often on the show. Having her be accidentally responsible for the death of a human being gives real weight to her presence and the moment she shared with Sam where he consoled her was really well done. As for Lucifer himself, he’s still trying to deal with the fact Crowley has complete control over him. It’s obviously a significant blow to his ego to have anyone calling the shots in such a way and Crowley clearly takes great joy in it which makes things even worse. Lucifer does appear to give up resisting and shows that he’s subservient by licking the floor on Crowley’s request. It’s demeaning but almost believable that Lucifer would prefer this situation to being stuck in the cage. Crowley proudly announces this apparently absolute power to all of his minions and everything seems pretty perfect if you happen to be Crowley. I love seeing Crowley on top for a change as he spends so much time being outwitted by the Winchesters or his mother. It’s easy to forget that the King of Hell used to be a force to be reckoned with but it’s a role that suits him. Of course Lucifer isn’t being completely honest and only wants Crowley to think that he has given up resisting. Meanwhile he hatches a plan to regain his former status which basically involves learning how his vessel works. It’s clear that enough Demons still fear him enough to want to help which. Even if they don’t then there’s more than enough hatred for Crowley to make the idea of overthrowing him appealing. It’s entirely possible that Lucifer’s plan will fail as Crowley has already stated that he’s 10 steps ahead at all times so it’s reasonable to assume that he has prepared for the possibility that his minions will try to betray him. Whatever happens this constant game of one upmanship between Crowley and Lucifer is a lot of fun to watch and has both characters at their best. With the impending arrival of Lucifer’s lovechild there’s a real opportunity to shake things up in a really interesting way. A watchable episode overall that does some thing well and other things poorly. Killing Mick at this point doesn’t really work as the character hadn’t been developed enough to make that meaningful yet. Sam and Dean won’t have any major reaction other than it confirming Dean’s feelings on the British Men of Letters. His backstory that reveals the Men of Letters as being evil completely lacks in subtlety and ruins the good work developing them as a complex organistation. The introduction of Dr. Hess doesn’t help matter either since there is no ambiguity around her. The development of the Lucifer lovechild story works really well because it doesn’t overpower the episode. We learn that Kelly will die when giving birth and Dagon clearly doesn’t have her best interests at heart which is enough for now. I suspect the birth will close the season and the child will be a problem next season. The return of Eileen was a welcome touch and her interactions with Sam are really compelling throughout. They have a respectful friendly relationship that comes across well. Lucifer hatching a plan to overthrow Crowley while pretending he has given in is promising so far as it has so much potential. I just wanted to say that I really appreciate your reviews of these episodes of Supernatural. I had only begun to watch the series within the past couple months and have grown to appreciate this long-running program. Your comments are spot on and touch upon every main point that each episode presents. Perhaps my tendency to agree with your accessment taints my impression of it all, but I do enjoy how your statements are concise and focus on storytelling and entertainment value rather than just meager oppinions. You always seem to qualify your statements as well as keeping an open mind about what the writers have in store for the series. Well done! Thanks very much for your kind words. You have pretty much summed up word for word what I hope people get from these reviews so it means a lot when people come forward to voice their praise of the way we do things around here. I hope you’ll make yourself known in the comments in future, especially if you happen to disagree because discussion is always fun. Well, I’m fairly new as a “discussion” participant, mainly content with observation up to this point. I admit that this episode in particular threw me, possibly for the same reason you iterated so well in the review. The backstory and death of Mick. Just when the character was becoming interesting, they do away with him. It does paint the British division as ruthless as the angels tend to be in the philosophy that the ends justifies the means. I cannot reconcile how the British MOL feels the need to spend much of their resources on conquering the States. It begs the question of why they cannot accomplish their tasks without all the American hunters on board. They seem to work independently without the need of local hunters as it is. Perhaps ridding themselves of the brothers can eliminate obstacles for them, but to eliminate all the hunters? seems a bit short-sighted and not unlike throwing a tantrum of sorts. It leaves me to wonder about Ketch and his future role. I am trying to preserve my faith in the writing that he will not be so one-dimensional in the end. As for Lucifer’s child, it may be as you say in that the child will be born at the end of this season, but I had assumed it would be earlier. Seeing that there are a few more episodes to go through, I imagined that the child would be born soon and we will be shown how it affects the Lucifer-Crowley relationship. I thought that they would require more time to expose how the child imposes the new threat. But the writers do like to present a non-traditional point of view. We’ll see if this child will be the threat that everyone expects. It brings to mind the half demon child, Jess, that we met in the past as well. Wouldn’t that be interesting? A half angel and half demon perhaps confronting each other? That may be interesting to watch. Sometimes the writers on this show don’t realise what a good thing they have. Mick and Ketch are essentially Sam and Dean on the MOL side. Mick is more centred and rational where Ketch is a blunt instrument. Obviously there’s more to Sam and Dean than that but at the same time that is broadly what you can attribute to them personality wise. There was room to play with that along with Mick getting to know the grey areas a bit more and thing about what informs his mission. 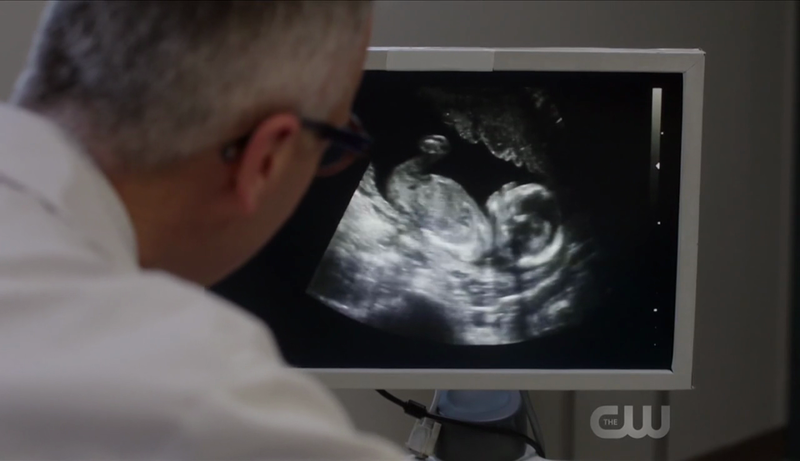 I can’t see Lucifer’s kid being born any time before the finale. If it is then it won’t make a significant impact as I feel that it’s setting things up for next season. Maybe it’ll grow quickly just as Amara did or indeed come out as an adult like Jasmine did in Angel -if you’ve seen that-. There’s a lot of potential here and I’m still on board though this season has been a fairly middling one in terms of quality. You seem to know your Supernatural so I’d love it if you chimed in a comment every week to let me know your thoughts as I love the discussion and don’t get enough of it. If you watch the other shows we cover then make your thoughts known. We love to talk here…as you can tell with our academic essay length reviews. The idea that Mick and Ketch are, in fact, pale reflections of Sam &a Dean is somewhat enlightening. The notion had not occurred to me. It seems that the only element missing (possibly intentionally) from the Brit MOL group is the ‘soul’. Traditionally, any successful character group contains the physical, mental and the spiritual (body, mind, soul). These elements are evident in our heroes: Dean exemplifying the physical-spiritual, and Sam, the mental-spiritual. Together, they are complete and essential. The MOL seems to function with only the mind and body, but perhaps that is the key in keeping our main heroes ‘special’ to the audience. This, killing off Mick becomes essential to the story…but, as you had stated, it was premature. I concede regarding the Lucifer’s child issue. It feels a bit drawn out, but as they did manage to prolong the Mark of Cain dilemma for one and a half seasons, the pattern does dictate that your prediction is accurate. And this would be correct in terms of the required “end of the season impact” . This season has been less than stellar, but I am hoping all this story building will pay off in the seasons to come. In terms of where the child thing will go it seems up in the air at this point but I don’t think there’s time to develop and finish that plotline this season. I think it’s safe to say that the consequences thing has been completely forgotten about. It seems to have been resolved by Cas killing Billie which is a shame as it could have been something that really went somewhere. Death was back on the table for Sam and Dean last season so they’ve yet to really do something with that. If you have any thoughts on the current episode please do share them in the comments of that one. As I said, I love to talk about this stuff.